Camp Sabra’s joyous Jewish community strengthens the Jewish identity of our campers and staff. Our core values of kindness (chesed), gratitude (hakarat ha tov), courage (avodat lev) and social responsibility (achrayut) inspires campers and staff to be life-long menches, advocates for justice, stewards of the environment, have a connection to Israel and remain engaged in Jewish community life. Joyous: We foster an environment where songs, cheers, ruach and fun permeate every experience. We teach a Judaism that celebrates one another and our traditions. 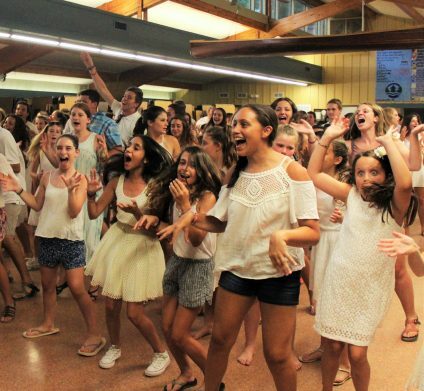 Jewish Community: We are an inclusive camp where people are accepted and uplifted for being themselves and supported for what feels good Jewishly for each individual. We build friendships that last a lifetime. Strengthen: We develop good qualities and enhance each other’s goodness. Jewish Identity: A pride in possessing Jewish values, knowingly experiencing Jewish traditions and being part of a community of Jews and Jewish traditions. Campers & Staff: Children and young adults from all over the world with varying religious, economic and community experiences. Core Values: The guiding Jewish principles that dictate our behavior and actions, helping campers and staff to have constant values in an ever-changing world. Gratitude: Recognizing the good in one another, in oneself, appreciating the land, history and traditions of camp and the Jewish people. Our community will express gratitude through their words and actions. Courage: Taking the risk to stand up for others, for oneself, for justice and Judaism. Trying new things, moving out of one’s comfort zone and challenge oneself physically and mentally, emotionally and spiritually. Social Responsibility: Develop an awareness of and an appreciation for community and our own role in participating and contributing to the betterment of our Sabra community and home community as well as the Jewish community as a whole. Menches: Making our core values part of one’s daily life. Stewards of the Environment: Gain an appreciation of nature through living in an outdoor environment and express that appreciation through actions (such as picking up trash, upcycling, etc.). Connection to Israel: Appreciate Israel as the historical, spiritual center of the Jewish experience. We want our community to gain knowledge about Israel’s historical and modern culture, form relationships with Israelis, learn modern Hebrew words and be inspired to visit Israel. Remain Engaged: Outside of camp, our campers and staff will make Jewish life choices, such as joining a Jewish youth group, participate in Jewish rituals like Shabbat candle lighting, become synagogue members as adults, become Jewish philanthropists, and engage in informal and formal Jewish educational experiences.